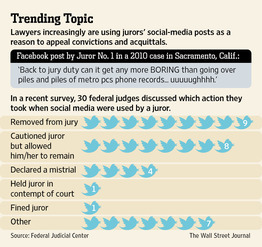 The Federal Judicial Center (“FJC”) recently published a report surveying 952 federal district court judges to identify the scope of jurors’ improper use of social media during trial and how the courts are addressing the problem. The FJC’s report, Jurors’ Use of Media During Trials and Deliberations, reflects that despite various prevention efforts, jurors continue to use Facebook, Twitter, Google and other sites in several, and that the courts continue to struggle to detect such usage. According to the survey results, 30 judges identified incidents of improper juror social media usage, but the results also reveal no established process for detection. Fellow jurors and the trial attorneys were the most common sources identifying a juror’s social media misconduct, suggesting that the problem is far more widespread given the absence of a clear detection mechanism. Upon learning of such improprieties, those judges either removed the juror, cautioned the juror, declared a mistrial, held the juror in contempt, fined the juror, or held a hearing to determine the scope and nature of information shared. In another case with an interesting twist, a Minnesota court considered a motion for mistrial after the prosecutor blogged about the case during trial on her public Facebook page. State v. Usee, (Minn. Appellate Court 2011). With no actual evidence that any of the jurors read those potentially prejudicial messages, the court denied the motion, but the incident highlights the importance of monitoring public social media use by opposing counsel and parties as well. For this reason, X1 Social Discovery features a specialized “public follow” feature that enables access to all the past Tweets of a specified user (up to 3200 past tweets) and any new Tweets in real-time without generating a formal “follow” request with the resulting problematic communication. This feature works within the public APIs provided by Twitter for third-party developers. And as Twitter has a full license to distribute all Tweets and make them publicly available per their terms and conditions, we believe this is the most proper method to obtain this information. To illustrate this important feature, we published this 1 minute video clip. These legal ethics rules concerning indirect social media communications underscores the importance of employing best practices technology to search and collect social media evidence for investigative and eDiscovery purposes. Collecting evidence in a manner that prevents, or at minimum, does not require that attorneys and their proxies directly or indirectly communicate with the subjects from whom they are collecting social media evidence is a core requirement for solutions that truly address investigative and eDiscovery requirements for social media. In addition to preserving and authenticating social media evidence in a proper manner, X1 Social Discovery provides fast and comprehensive searching of the data in a manner unmatched by any other technology. It can even potentially prevent a possible mistrial through early detection of a juror’s improper Tweets or Facebook postings.